Mars rovers here on Earth - Solar System Planets And Moons Section. 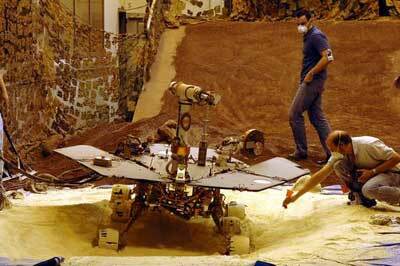 Mars rovers here on Earth. Testing Strategies to Get Opportunity Unstuck. NASA engineers are using a duplicate version of the Mars rovers here on Earth to try and test strategies Opportunity could use to dig its way out of a sand dune. The rover bogged down during a drive on April 26, and controllers have asked it to just stay put while they work on the best way to escape. The team is experimenting with a mixture that they think mimics the composition of the sand in the dune, and hope to put what they've learned to the test next week. While Cassini scientists are studying Titan's atmosphere, the Huygens team is analyzing its surface. The European Space Agency has released a mosaic of images that show Titan's surface and the region the probe landed on January 14. The Descent Imager Spectral Radiometer (DISR) took a series of "image triplets" as it descended towards Titan's surface. Image specialists have looked for common elements in the pictures, and then used them to build up this mosaic. Titan's Atmosphere is Looking Very Familiar. Scientists have had an opportunity study much of the data sent back by Cassini about the composition of Titan's atmosphere - it's more familiar than you would think. The thick atmosphere is rich in organic compounds, which are similar to conditions that might have been found early in the Earth's history. The Cassini science team also found a vortex above Titan's north pole, which is very similar to the situation on Earth that leads to the ozone hole. Titan has no ozone, but this polar vortex isolates gas during winter and could allow complex Chemistry to occur.